Brooke Sydnor Curran used to be a pack-a-day smoker. Now she is making healthier choices for herself — and for her community. 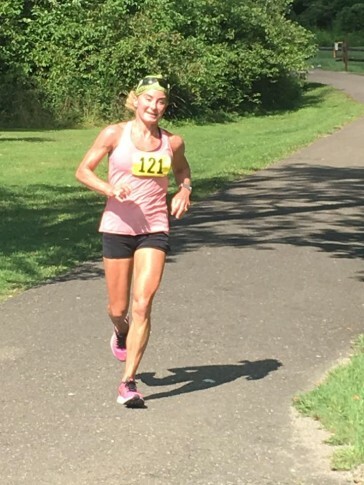 In this first installment of the WTOP series profiling Marine Corps Marathon runners, the Alexandria native explains how she has helped thousands of local kids by running marathons. Brooke Sydnor Curran is the founder of RunningBrooke, a nonprofit that renovates playgrounds in Alexandria, Virginia, neighborhoods where most of the children are younger than 5. Editor’s note: All this month leading up to the Marine Corps Marathon, WTOP’s Jamie Forzato is bringing you stories of runners who have endured loss, persevered through personal struggles and found hope. ALEXANDRIA, Va. — Brooke Sydnor Curran used to be a pack-a-day smoker. But after college, she started making healthier choices and turned to running as a way to unwind. Then, the Sept. 11 terrorist attacks happened. “Until 9/11, I felt like life was leading me. I felt like I hadn’t really gone after stuff that I wanted in life. And 9/11 kind of shocked me into the precarious and fragility of life,” she recalled. She wrote a bucket list. Running a marathon was at the top. Her first was the Marine Corps Marathon in 2004. That’s when an encounter changed her life forever. She was driving in Alexandria on a rainy, cold February day, when she saw a young mother pushing a child in a stroller weighted down with grocery bags. “Our eyes met. You could just see and feel the heaviness and the weight of the world on her shoulders. It was like a second lightning bolt moment. I realized that I’m in a position to do something,” she said. She founded RunningBrooke, a nonprofit that renovates playgrounds in Alexandria neighborhoods where most of the children are younger than 5. She pledged to run in all seven continents and all 50 states to raise money and awareness. “Antarctica was ridiculous, in a terrific way. That was 40 mile-per-hour sustained winds and sleet. We were running in mud,” she recalled. Fast forward seven years, RunningBrooke has helped more than 5,000 children. The Hume Springs Park playground on Dale Street was her most recent project. “Before we came, there was a 10-foot-high chain link fence that surrounded the park. It had a very prison-like feel. The lighting wasn’t good. There were no trash cans or benches. There was no water fountain. There were no picnic tables. There were no trees and plants,” she said. Today, it’s a clean, updated space filled with Virginia-native plants and flowers. Brooke’s journey is coming full circle. The Marine Corps Marathon was her first marathon. This year’s Marine Corps Marathon, scheduled for Oct. 30, will be her 100th.